The art of making string lanterns or string lighting is not my original idea. I found this example on the Internet and used their basic directions to make the string globe lights you see pictured above. There were some areas of the instructions I didn't understand, so I tweaked the materials and steps involved in order to get the process to work for me. Hopefully, the following tutorial is beneficial to you. I've tried to make it as thorough as possible. Be forewarned, making string lanterns or string lighting is not rocket science and it's certainly not an expensive project, but IT IS MESSY! lol So, dress accordingly and do this project either outside or in a craft area where you can spread a tarp on the floor. Blow up balloon and tie securely. Using permanent marker, draw a circle around the knot in balloon that is just large enough to accommodate whichever lighting method you've chosen. If using tiny Christmas lights, opening can be very small. Draw the circle approximately 2 1/4" in diameter (side to side measurement) if using a standard light bulb. Note: another option for these string lanterns is to use without lights and hang the string globes in groups as a sort of mobile. In this case, forget about leaving any openings during the construction process. Prepare work area by laying down tarp. You will need to hang the balloon from a hook or otherwise suspend it so all sides are not touching any areas. 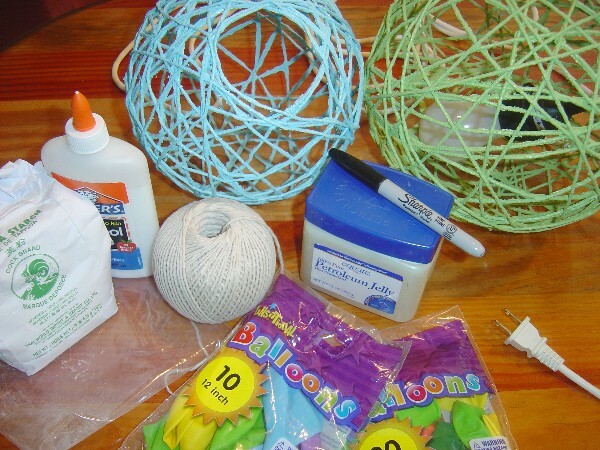 Cut twine at a comfortable working height for you and tie twine around knot in balloon. 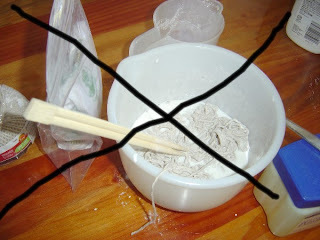 Mix starch, white glue and hot water in container until all lumps are removed. Consistency should be like a thick creamy soup. Tip: Add water to the dry ingredients slowly while stirring and adjust as needed. Put on disposable gloves if you don't like getting your hands messy. Smear Vaseline all over the balloon until all areas are coated. 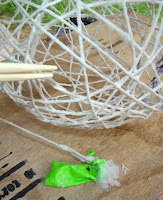 Begin feeding the twine a bit at a time through the wet mix and drape over the balloon. Tuck under the end pieces of the twine at start and finish. Be sure to follow the lines of the circle drawn in step 1. (Under the picture you'll see an explanation of why this is so important.) Continue wrapping vertically at first at a comfortable tightness and gradually switch to wrapping the twine horizontally. In the picture above, you will see two string globes. Both have dried well enough and the balloons popped by themselves. The globe with the purple balloon was my first attempt at making these. See how I continued the twine at the top and it actually covers the knot? WHAT was I thinking?? Arrrgh! Don't do that! Be sure to follow the directions in step 1 above depending on how you'll be using these string lanterns when complete. Plan ahead. Allow string lanterns to dry at least 24 hours until twine is completely rigid. If balloon has not popped, do this now and discard remnants. 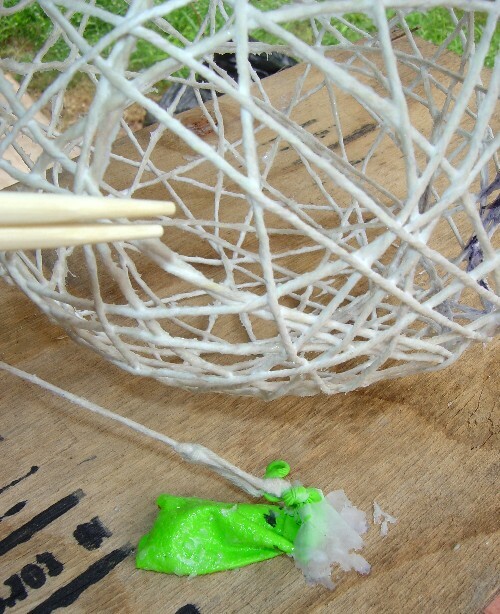 Use a chopstick or something similar to gently knock off any thin glue crystals that may have developed in between the twine. Spray outdoors or in a well ventilated area in either a clear coat or color of choice. Use two light coats if necessary, not one heavy coat. Either way, I feel this step further strengthens the globe. Let dry well between coats. 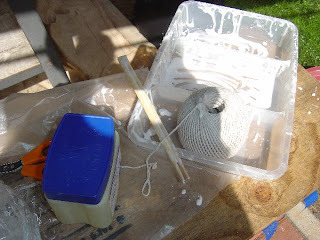 Some of the materials involved in the process. Just a section of my work area AFTER construction. Use as much or as little twine as desired to make these DIY string lanterns. You can also change the appearance by using smaller or larger balloons. Spraying a clear acrylic spray instead of adding color is another option. It all depends on the look or style you're going for. Christmas lights only require a tiny opening to insert. Make the hanging string lantern above by first running the plug part of the lamp cord through the opening and continue on in a direct line and out one of the openings in the design, allowing the constructed opening to face downwards. This way it is easy to change lightbulbs when needed. Anyway, above is the "teaser" pic I posted several weeks ago. I've been working on these string lanterns off and on since then. Finally, I felt like I had enough info and pics for a decent tutorial. I'm sure your construction process will go smoother than mine. Just be patient with the process and have fun with it. And, oh yeah, PLEASE show us your pics. It's always fun to see new versions of the "same thing". Have a wonderful weekend everyone! Linking this project to the Weekend WrapUp Party at Tatertots and Jello, Funky Junk Interior's Saturday Night Special and The Sunday Showcase Party at Under the Table and Dreaming. Great project, I love how it looks. I'm a new follower from friend fridays. Have a great weekend. Totally cool project !! Thanks for visiting me in my organized chaos. Believe me trying to do and keep up with all I have to do leaves me short of breath and energy too ! I just got the good news that my vacay starts tonight !! I'm following you back ! I just bought some wicker globes like this at goodwill. They only had two and I spraypainted them. I was wishing to find more, but you have now solved my dilemma! Thanks! Found you from NFF-love this idea! How fun would this be to do for halloween-or any holiday for that occasion! Great tutorial! So glad that you told us not to put all of the twine in the bucket at onece. I so would have done this-so thanks for the heads up! Great blog!! I tried this sometime back and it was a total disaster.I have blogged about it but I am gonna try again.I really really want to be successful at making this.Thanks for the tutorial.I am sure it will help.Great job on yours. new follower. thanks for following me :) nice blog. 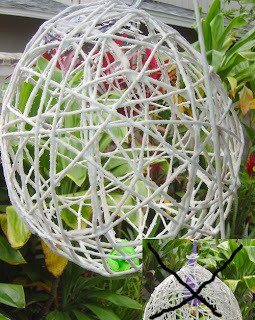 love the string globes...something i've never done that looks fun & easy. can think of lots of places those would look great! maybe i'll get around to doing some black & white ones for above my babies crib (w/out the lights). add your button to my blog! Great, thorough instructions and useful photos, as always! I love this idea! Very cool - I've used that concept for other types of crafts but I like this idea too!! Wonderful tutorial and well thought out. Appreciate all your useful info! And I LOVE your string lanterns, they are just beautiful. Gotta try this and soon! What a cool idea! I think I might have to try it one day! Thanks so much for becoming a follower of my blog!! Thanks for stopping by! I am following you now:) I LUV your blog btw!! the Pothos(?) planter with the hangers is AWESOME! That's such a great idea! It reminds me of a project I did with my Grandma when I was little. I love these- they turned out awesome. Makes me want to try to make some of my own. Thanks for the inspiration! Thanks for posting the tutorial! I've been wanting to do these for a long time! WOW! Thank you so much for this tutorial!! 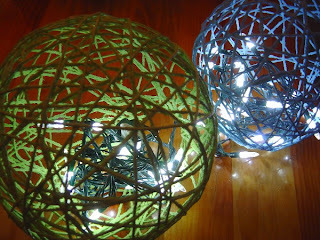 I've never heard of string lanterns, but am *loving* the idea! Thanks for sharing! Thanks so much for sharing this, I now want to try it. Our patio needs a little decorating and this may be just the perfect thing. This is a lovely craft here. 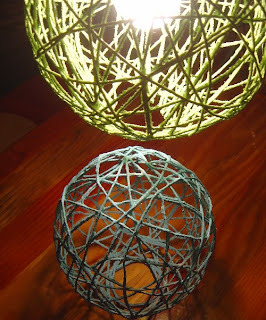 I love the way the blue and green color of the twine makes the lighting appear. Very lovley. I love this! and thank you for the 'learn from my fail' tips. These are now on my craft to do list, and I know EXACTLY where I'm going to put them in our new house. thank you again for the easy tutorial!! I surely enjoyed this project. I wanted to share with you that I have included it in my August bookmark post on my blog. Thank you for the inspiration, my friend. Do you think you could add dried flowers to this project? 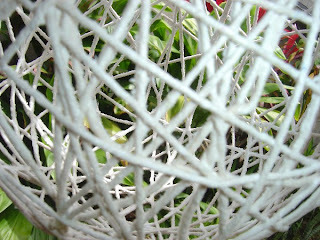 Like paper mache the flower onto the ballon and then the twine? Do you think it would work if I tried adding dried flowers into the mache process? And if so would you do it before adding the twine or after? Hi kfry! If I understand your question correctly, I would completely wait until the twine has dried and the balloon has been popped. 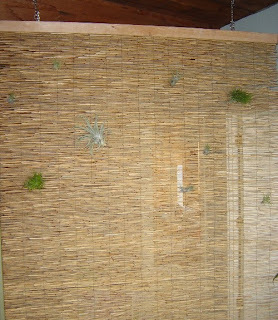 IF you plan to spray paint the twine do so before adding the dried flowers. 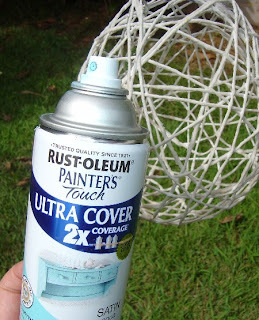 If no colored paint is planned, I'd add dried flowers on top of the twine using the glue mixture. Allow to dry again and then spray with the satin finish poly to protect. I hope this makes sense. Let me know how it turns out. It sounds lovely! Thank for the detailed steps and the images, very helpful. Now is there anyway to connect them. I was thinking of somehow attaching three round twine balls to make them into a trellis so my clematis in container to grow up and around the balls I think it would be very attractive. Are they strong enough to tie them to a support pole? Pam I love your design....thanks for sharing. Friday Follow and New Friend Fridays! It's Tuesday Tag-Along at Twee Poppets!